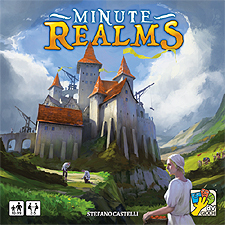 Minute Realms is the most compact city-building game ever. In a handful of rounds, you will have to build up your realm and make it grow by spending your riches. Will you yield splendour to your lands with refined buildings, or will you defend them with imposing bastions to repel the upcoming fall of the invaders? A kings life is not easy; every decision is crucial to the fate of the realm - and every single move makes the difference between victory and defeat.